The incentives to structure the acquisition of real estate this way may include (depending upon the jurisdiction involved) the avoidance of having to purchase expensive documentary stamps for the transfer of the deed. The parties may also have been seeking to avoid having to pay expensive transfer taxes. THIS AGREEMENT OF PURCHASE AND SALE (this “Agreement”) is dated the ___ day of _______, 20__, by and between COMMERCIAL PROPERTY OWNER LLC, a _________ limited liability company (“ Seller ”), and COMMERCIAL PROPERTY BUYER, a _________ limited partnership (“ Purchaser” ). Seller is or will be the owner of all the membership interests (the “Interests”) of _____________, LLC, a _________ limited liability company (the “ LLC Owner ”). As of the Closing (defined herein) the LLC Owner will own the Property (as defined herein) located in _________ County, _________, consisting of two (2) industrial buildings that total approximately __________ RSF. Purchaser and Seller desire to set forth their agreements concerning the terms and conditions pursuant to which Seller will sell to Purchaser and Purchaser will buy from Seller the Interests. (a) The real property described in Exhibit “A” attached hereto and made a part hereof (the “ Real Property ”), together with (i) all improvements located thereon, including, without limitation, all of the buildings, structures, fixtures, facilities, installations and other improvements of every kind and description now or hereafter in, on, over and under the Real Property (collectively, the “ Improvements” ), and (ii) all other rights, benefits, privileges, easements, tenements, hereditaments and appurtenances, if any, thereon or in any way appertaining to the Real Property and being included within the definition thereof. 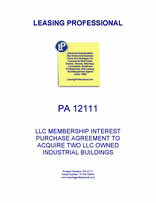 (b) All leases (including any amendments thereto) of industrial properties on the Real Property, including leases which may be executed by Seller and/or the LLC Owner after the date hereof and prior to Closing, pursuant to the terms and conditions of this Agreement (collectively, the “ Leases ”). A rent roll of the Leases affecting the Property or any part thereof (such summary being referred to in this Agreement as the “ Rent Roll ”) is attached to this Agreement as Exhibit “B” and made a part hereof. (c) All equipment, machinery, appliances, furniture, furnishings, and other tangible personal property owned by Seller and/or the LLC Owner, now or hereafter located in the Property and used in connection with the ownership or operation of the Real Property or the business conducted thereon (collectively, the “ Tangible Personal Property ”). A list of the Tangible Personal Property items with a value exceeding One Hundred Dollars $100.00 is attached hereto as Exhibit “C” . (d) A nonexclusive right to the use of the name “______________” in connection with the Property, permits, warranties, guaranties, and all other intangible property used in the ownership or operation of the Real Property or the business conducted thereon (collectively, the “ Intangible Personal Property ”). (e) The following assets are excluded from this transaction and will be retained by Seller: Utility deposits. 1.2. Purchase Price. The purchase price for the Interests (the “Purchase Price”) is _________________DOLLARS ($________), to be paid as follows: (a) the Earnest Money Deposit (as defined herein) and (b) the balance of the Purchase Price payable at Closing or any extension thereof in immediately available U.S. funds. (a) The “Effective Date” shall mean the date Purchaser receives a fully executed counterpart of this Agreement. Within three (3) business days after the Effective Date, Purchaser shall deposit with __________________ (“ Escrow Agent ”) by wire transfer of immediately available U.S. funds to be held by the Escrow Agent, the amount of ONE HUNDRED THOUSAND AND NO/100 DOLLARS ($100,000.00) as earnest money deposit (such amount and all interest earned thereon is referred to herein as the “ Initial Earnest Money Deposit ”). The Initial Earnest Money Deposit shall entitle Purchaser to inspect the Real Property and Personal Property for a period from the Effective Date until ____________ under the terms of Article 2 (the “ Inspection Period ”). If Purchaser does not terminate this Agreement on or prior to the end of the Inspection Period, Purchaser shall deposit with Escrow Agent an additional ______________ DOLLARS ($_______) (such amount and all interest earned thereon is referred to herein as the “ Additional Earnest Money Deposit ”) in cash to be held and disbursed by Escrow Agent in accor­dance with the remaining provisions of this Agreement. The Initial Earnest Money Deposit and the Additional Earnest Money Deposit are referred to herein collectively as the "Earnest Money Deposit." (i) Escrow Agent shall hold possession of, keep, deliver and dispose of the Earnest Money Deposit subject to the terms and conditions of this Agreement and shall otherwise deal with the parties hereto fairly and impartially according to the intent of the parties as herein expressed; provided, however , that Escrow Agent shall not be deemed to be a party to this Agreement except for its obligations hereunder as Escrow Agent for the purposes of holding the Earnest Money Deposit and shall not be responsible or liable in any manner whatsoever for the sufficiency, manner of execution or validity of any written instructions, certificates or any other documents received by it (provided the Escrow Agent shall at all times act in good faith in acting only on documents which it believes the signatures thereon genuine), nor as to the identity, authority or right of any persons (other than Escrow Agent) executing this Agreement (except in the event that Escrow Agent has a good faith reason to believe the identity, authority or right of any persons is not genuine). Escrow Agent shall be entitled to rely at all times on instructions given by Seller and/or Purchaser, as the case may be and as required hereunder, without any necessity of verifying the authority therefor. (ii) Escrow Agent shall not at any time be held liable for actions taken or omitted to be taken in good faith and without gross negligence. Seller and Purchaser agree to save and hold Escrow Agent harmless from and against any and all losses, claims or demands arising out of its actions hereunder and hereby agree to indemnify Escrow Agent from any such losses, claims or demands arising out of its activities hereunder as the holder of the Earnest Money Deposit. (iii) It is further understood and agreed by Seller and Purchaser that if, as a result of any disagreement between them or adverse claims and demands being made by any of them upon Escrow Agent, or if Escrow Agent otherwise shall become involved in any litigation with respect to the disbursement of the Earnest Money Deposit, such parties agree that they, jointly and severally, are and shall be liable to Escrow Agent and shall reimburse Escrow Agent on demand for all costs, expenses and counsel fees it shall incur or be compelled to pay by reason of such litigation. (iv) In taking or omitting to take any action whatsoever hereunder with respect to the disbursement of the Earnest Money Deposit, Escrow Agent shall be protected in relying upon any notice, paper or other document believed by it to be genuine, or upon evidence deemed by it to be sufficient, and in no event shall Escrow Agent be liable hereunder for any act performed or omitted to be performed by it hereunder in the absence of gross negligence or bad faith. Escrow Agent may consult with counsel in connection with its duties hereunder and shall be fully protected in any act taken, suffered or permitted by it in good faith and without gross negligence in accordance with the advice of such counsel. (c) If the transaction contemplated by this Agreement closes in accordance with the terms and conditions of this Agreement, at Closing or any extension thereof, the Earnest Money Deposit shall be delivered by Escrow Agent to Seller as payment toward the Purchase Price. 2.1. Inspection Period. Purchaser shall have a period from the Effective Date until __________ (the “ Inspection Period ”) in which to inspect the Seller's records and the Property. The Inspection Period shall commence on the Effective Date and shall terminate at 5:00 p.m. __________ Time on __________. During the Inspection Period, Purchaser may employ engineers to inspect the Property and to conduct surveys, tests, studies, soils/environmental hazardous waste studies and termite and pest infestation studies thereon and any other studies, tests and surveys contemplated by this Agreement and otherwise as may be necessary or required in determining that the Improvements have been built in a good and workmanlike manner and that the Property and the Due Diligence Documents are in all respects satisfactory to Purchaser, in its sole discretion. Purchaser shall have the right at its sole expense, within the same period to inspect the Property and the Due Diligence Documents to satisfy itself that the physical condition of the Property and the Due Diligence Documents are acceptable to it. It is specifically understood and agreed that, within the Inspection Period, Purchaser may approve or disapprove of the Property and/or the Due Diligence Documents for any reason whatsoever; however, the Earnest Money Deposit shall be governed by Section 1.3; provided further, however, in the event Purchaser determines to terminate this transaction within the Inspection Period, the Earnest Money Deposit shall be returned to Purchaser. If, for any reason, Purchaser, in its sole discretion, determines during the Inspection Period that the LLC Owner or the Property is unsuitable for its purposes, then at any time during the Inspection Period, Purchaser may notify Seller and Escrow Agent in writing that it has elected to terminate this transaction (such notice is referred to herein as the “ Termination Notice ”), and the parties hereto shall be relieved of all remaining liabilities and obligations under this Agreement, except those that expressly survive hereunder. If the Termination Notice is not sent to the Seller and/or Escrow Agent prior to the end of the Inspection Period, this Agreement shall automatically continue. (a) The most current ALTA surveys of the Property (the “Survey”). (b) Electronic copies of all tenant leases, subleases and ground leases, including all amendments, currently in effect at the Property and all financial credit information for each tenant. (c) Copy of Seller’s owner’s title insurance policy for the Property. (d) Unaudited operating statements covering the Property for the past two (2) years. (e) The most recent version of the _______ and _______ operating budget for the Property. (f) Operating account bank statements for the past two (2) years. (g) A current rent roll for the Property is attached as Exhibit “B” to this Agreement. (h) Monthly utility bills or evidence of payment for utilities for the Property for the past twelve months. (i) All contracts and agreements affecting the Property, including without limitation, those pertaining to service, labor, construction, management, maintenance and brokerage. (j) Any as-built plans and specifications for the Property, including soil reports. (k) A list of all threatened, pending, or ongoing claims or lawsuits and all outstanding judgments relating to the Property, including without limitation, suits for nonpayment of rent or for the purpose of tenant eviction and all documents related thereto. (l) All policies of insurance evidencing all casualty, liability, and other insurance policies presently in effect with respect to the Property. (m) Any other reports, studies, tests, surveys, assessments or other materials pertaining to the ownership, operation or condition of the Property in Seller’s possession or reasonable control. (n) Property tax bills for _____ and _______. (o) All records pertaining to the LLC Owner. (p) All building reports, environmental reports, structural reports, site plans, floor plans and engineering data that seller has in its possession. (q) All advertising, marketing, collateral material and/or promotional programs being utilized by the Property (including computer artwork, ad layouts, etc.) in paper format. (s) Aging receivables report for the current year and last three calendar years. (t) Copy of easement for right of way access to __________________. 2.2. Estoppel Certificates. During the Inspection Period, Seller shall deliver to Buyer estoppel certificates with respect to the Leases from tenants leasing no less than 85% of the space in the Property (" Estoppel Certificates "). The Estoppel Certifi­cates shall be in form attached hereto as Exhibit "D" and shall not disclose the existence of any default under the Leases and shall contain information that is consistent with and confirms (a) the terms of the Leases, (b) the information contained in the rent rolls delivered by Seller to Purchaser, and (c) the information contained in the account receivable aging report of the Property delivered by Seller to Purchaser. Seller shall deliver copies of the Estoppel Certificates promptly after their receipt from any tenant.